People say everything is better with bacon. Well we say everything's better bacon-wrapped, especially when it comes to throwing a party. 1. Preheat the oven to 350°F. 1. Slice the dates lengthwise on one side to create an opening. Remove the pit. 1. Using a spoon, stuff a small amount of goat cheese into the cavity of each date and press the sides together to close. 1. Cut the bacon slices in half. 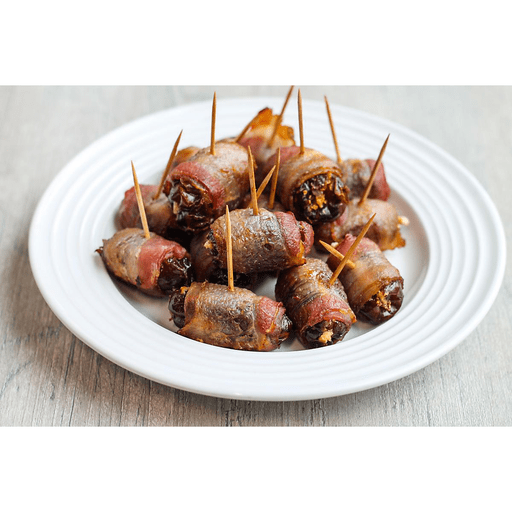 Wrap each date with a slice of bacon and secure with a toothpick. 1. Arrange evenly on a baking sheet with raised edges (otherwise grease will get everywhere) and bake for 10 minutes. Remove the dates and use the toothpick to turn each one so it's lying on its side. Bake for another 5-8 minutes, until browned to your liking, and turn the dates to the other side and repeat. Remove from the oven, place on a paper towel lined plate, and let stand for 5 minutes before serving. Calories 110, Total Fat 8g (Saturated 1.5g, Trans 0g), Cholesterol 5mg, Sodium 90mg, Total Carbohydrate 6g (Dietary Fiber 1g, Sugars 6g), Protein 4g, Vitamin A 2%, Vitamin C 0% Calcium 6%, Iron 2% *Nutritional values are an approximation. Actual nutritional values may vary due to preparation techniques, variations related to suppliers, regional and seasonal differences, or rounding.